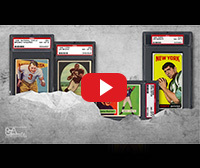 The 1969 Topps Football Card Set – A Vintage Set with Appeal that Extends Beyond "Borders"
To say the 1969 Topps Football card set is bursting with color is not saying enough. This eye-appealing issue is one that also contains some terrific rookie cards, like those of Hall of Famer Larry Csonka and the popular Chicago Bear’s player Brian Piccolo. Piccolo, who passed away at the early age of 26 from cancer, was the subject of one of the most beloved sports movies of all time – Brian’s Song (1971). This 263-card issue is not only aesthetically pleasing, but it is also challenging to build in high-grade due to the number of cards that exhibit colored borders. The borders are very susceptible to edge and corner wear. In the following article, we take a deeper look at this striking set. From 1980 to 1989, Topps produced some of the most popular football card sets in hobby history. So many terrific players made their debut during the decade and the sport started to gain in popularity, long before the days of Fantasy Football. There was Montana and Marino, Elway and Rice. With so many great players entering the league, certain years and sets tend to get overlooked. One such set is the 396-card, 1983 Topps issue. The two key rookies in this set are those of Mike Singletary and Marcus Allen, followed by the first card of the colorful former quarterback Jim McMahon. In the next piece, we talk to the collectors who pursue this Topps release. For some, the name Archie Manning is synonymous with football. Whether you are looking at his college football career or his pro football career, Archie Manning definitely contributed to the sport. The majority of his pro football career was with the New Orleans Saints; drafted in 1971, he played with the Saints until 1982. He did a brief stint with the Houston Oilers as well as the Minnesota Vikings. From his two time Pro Bowl selection to being inducted into the College Football Hall of Fame, Manning clearly left his mark. This collectors set has won the Best of the Registry award since 2003 and with a weighted GPA of 9.63 is the highest rated set ever to be registered on the PSA Set Registry. Click here to view this set. A terrific assortment is offered with tremendous investment-quality pieces from all sports and the historical and political worlds. It features another amazing array of items that caters to every level of collector and investor. Whether you only want to spend a few hundred dollars or several thousand dollars, our selection of quality items has a little something for just about everyone. Several unique lots headline this auction. There are 522 lots in this auction. This auction features many high grade and low pop cards for collectors to complete their sets from the 1950s through the 1970s. Rookies include Frank Robinson, Nolan Ryan, Tom Seaver, Roger Maris, Roberto Clemente, Sandy Koufax, Ralph Kiner, and more. The November Auction contains 416 lots from the four major sports, boxing and non-sports. 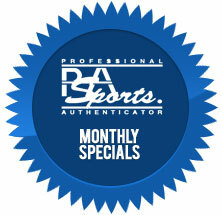 Consists of hall of famers, commons, graded and ungraded, sports cards, memorabilia and autographs, something for everyone! PWCC Auctions is offering over 1,000 high-end lots, spanning all sports and genres. SCP Auctions’ 2015 Fall Premier online auction begins next Wednesday, Nov. 18, and runs through Saturday, Dec. 5 at www.scpauctions.com. The online preview, however, starts tomorrow. Top lots include a 1948 George Mikan Bowman rookie card, the only one of its kind that’s been graded Gem Mint 10 by PSA; Joe DiMaggio’s 1951 game-worn Yankees road uniform from his final season; a previously unknown and impeccably preserved Ernie Banks 1969 Cubs Roads jersey; and more! So far, which NFL player is making the greatest hobby impact this season based on their performance and popularity?